LAKE FOREST, Ill. — The Lake Forest College women’s basketball team pulled away early Saturday and rolled to a 90-32 Midwest Conference victory over Lawrence University in the season finale. Lake Forest scored the first 16 points of the game and led 29-5 after the first quarter. The Foresters (6-17, 5-13 MWC) stretched that margin to 51-14 at the half. Brittany Avonts led Lake Forest with a double-double of 18 points and 11 rebounds. Bridget Bilek paced the Foresters and all scorers with 22 points. Nicole Cummins and Lauren Deveikis led Lawrence (2-21, 0-18) with eight points apiece, and Cummins picked up three assists. Leah Reeves chipped in with seven points for the Vikings, and Shonell Benjamin pulled down a team-high eight rebounds. APPLETON, Wis. — The Ripon College women’s basketball team used big second and third quarters Tuesday to roll to a 64-38 Midwest Conference victory over Lawrence University at Alexander Gymnasium. Ripon outscored the Vikings 35-10 over the middle two quarter to pull away. 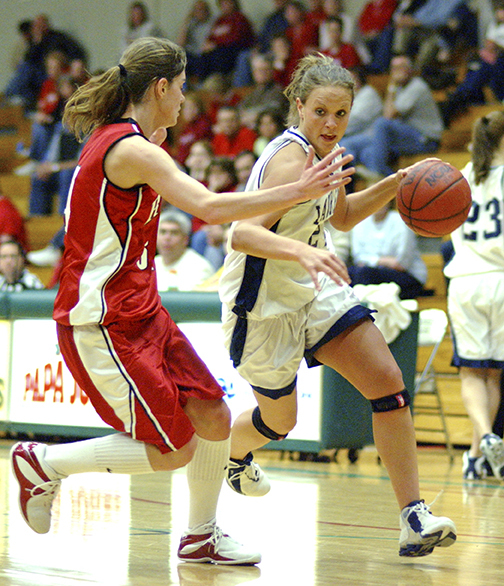 Maggie Oimoen went 11-for-13 from the floor on her way to a game-high 23 points for Ripon (16-6, 14-3 MWC). Eleanore Mueller added 11 points and nine rebounds for the Red Hawks. Aubrey Scott came off the bench to pace Lawrene (2-20, 0-17) with 10 points. Olivia Hoesley added nine points for the Vikings. Lawrence’s Nicole Cummins nailed a jumper to start the second quarter and cut Ripon’s lead to 14-11. Ripon then reeled off the next 14 points to push its lead to 28-11 with 3:53 left in the first half. Ripon then opened the third quarter on a 17-3 run, capped by Mueller’s layup, to take a 45-16 lead with 4:43 left in the period. Ripon stretched the lead to as many as 35 points, and Lawrence never got closer than 26 the rest of the way. APPLETON, Wis. — The Lawrence University women’s basketball team wraps up the regular season with a pair of games this week. 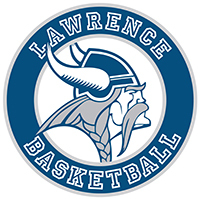 The Vikings host Ripon at 5:30 p.m. on Tuesday at Alexander Gymnasium before traveling to Lake Forest College for a 1 p.m. game on Saturday. APPLETON, Wis. — The Monmouth College women’s basketball team hit 12 3-pointers Saturday en route to a 72-39 Midwest Conference victory over Lawrence University at Alexander Gymnasium. The Scots went 12-for-24 from beyond the arc and were led by rookie Yvonne Ornelas. She went 9-for-10 from the floor, including 5-for-6 on 3-pointers, on her way to a game-high 23 points. Leah Reeves came off the bench to pace Lawrence (2-19, 0-16 MWC)with 11 points, and she pulled down six rebounds. Natalie Kramer added 10 points for the Vikings, and Shonell Benjamin grabbed seven rebounds. The Scots were hot from the start, hitting their first four shots from the floor and making their first four 3-pointers. Monmouth had built an 18-5 lead just six minutes into the game. Lawrence got four consecutive points from Reeves and a pair of free throws from Kramer to trim the margin to 18-11 after one quarter. The Scots stretched the lead to 17 before Lauren Deveikis hit a 3-pointer in the final seconds to cut the lead to 35-21 at the half. Monmouth started the second half on a 16-6 run to pull away to a 51-27 edge. Lawrence never got closer than 21 points after that. RIPON, Wis. — The Ripon College women’s basketball team pulled out to a big early lead Wednesday and went on to an 83-30 Midwest Conference victory over Lawrence University at the Storzer Center. Ripon jumped out to a 19-5 lead after the first quarter and stretched that margin to 45-16 at the half. Olivia Hoesley scored a game-high 15 points and grabbed six rebounds to lead Lawrence (2-18, 0-15 MWC). Megan Jensen and Emma McDonald scored 14 points apiece to pace Ripon (14-6, 12-3), and Maggie Oimoen added 13 points and nine rebounds. Ripon scored the first 14 points of the game and led by 24 points early in the second quarter. The Vikings trimmed the margin to 18 points after a 3-pointer from Hoesley and a jumper from Shonell Benjamin. The Red Hawks went on a 12-1 run to finish the second quarter and led by 29 points at the break. The final margin was Ripon’s largest lead of the game. APPLETON, Wis. — The Lawrence University Student-Athlete Advisory Committee is sponsoring the LU Pride Game on Saturday when the Vikings host Monmouth College in a Midwest Conference doubleheader. 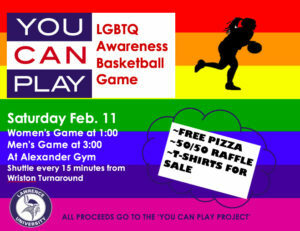 All proceeds from the LGBTQ awareness games go to the You Can Play Project. You Can Play works to ensure the safety and inclusion of all in sports, including LGBTQ athletes, coaches and fans. You Can Play seeks to challenge the culture of locker rooms and spectator areas by focusing only on an athlete’s skills, work ethic and competitive spirit. The Lawrence games get started with the women facing Monmouth at 1 p.m. at Alexander Gymnasium. The men’s game against the Scots follows at 3 p.m. There is no admission fee for Lawrence basketball. Adding a special element to Saturday’s game are local Special Olympians, who will play a game during halftime of the men’s contest. 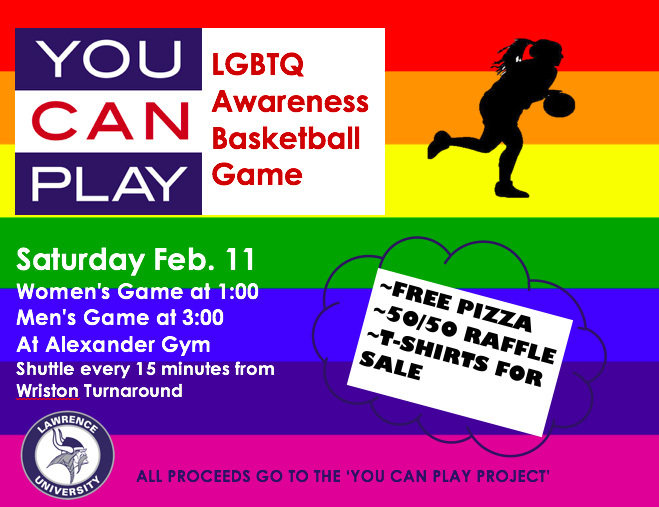 The Lawrence SAAC will be handing out free pizza for students and T-shirts will be available for purchase. SAAC representatives will put on a 50/50 raffle, have a pledge wall and collect donations for You Can Play. The Lawrence SAAC is a committee made up of student-athletes assembled to provide insight on the student-athlete experience. The SAAC also offers input on the rules, regulations and policies that affect student-athletes’ lives on NCAA member institution campuses. 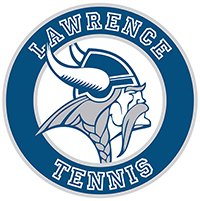 SAAC also is involved in community outreach efforts, including events on the Lawrence campus and work in local schools. APPLETON, Wis. — The Lawrence University women’s basketball team hits the road Wednesday to face Midwest Conference contender Ripon College before returning home on Saturday to face Monmouth College. Wednesday’s game at the Storzer Center is set for 5:30 p.m., and Lawrence entertains the Scots at 1 p.m. Saturday at Alexander Gymmasium. APPLETON, Wis. — The Beloit College women’s basketball team pulled away in the third quarter Saturday and went on to a 64-40 Midwest Conference victory over Lawrence University at Alexander Gymnasium. The Bucs started to pull away late in the second quarter and then outscored Lawrence 13-5 in the third quarter to build a 43-21 advantage. Melissa McLean scored 17 points off the bench and grabbed eight rebounds to pace Beloit (6-13, 4-10 MWC). Natalie Kramer led Lawrence (2-17, 0-14) with 13 points, and Olivia Hoesley and Lauren Deveikis added seven points apiece. Hoesley and Shonell Benjamin paced the Vikings with seven rebounds apiece. Lawrence trailed by eight late in the second quarter, but the Bucs scored the final six points of the first half to grab a 30-16 lead at the break. The Vikings then went just 2-for-11 from the floor and committed five turnovers in the third quarter. McLean scored five points in the third quarter for Beloit, and Nora Polaski and Shelby Kline added four points apiece. Kline finished with 16 points and Polaski added 12. Beloit led by as many as 28 points early in the fourth quarter, but the Vikings put together a 10-3 run, highlighted by 3-pointers from Kramer and Deveikis, to close to 56-36. That’s as close as Lawrence would get. Molly Bouressa was a basketball and softball standout for the Vikings. APPLETON, Wis. — The Lawrence University Department of Athletics are asking fans to be generous and help a little girl when they attend Saturday’s basketball games vs. Beloit College. It’s Alumni Day on Saturday, and Lawrence alumna Molly Bouressa Van Zeeland, class of 2007, is on the mind of many of her former Lawrence teammates and classmates. A former basketball and softball star at Lawrence, Molly gave birth to Macy last summer. Macy has battled a number of medical issues and has endured countless surgeries in her first year. To help the Van Zeeland family with expenses, fans will be asked to donate to the family during both basketball games on Saturday at Alexander Gymnasium. The women’s game vs. the Bucs starts at 2 p.m. with the men’s game to follow at 4 p.m. Alumni games will be held in the morning with the women tipping off at 9 a.m. and the men following at 10:15. There is no admission charge for any of the games.